Awarding Ceremony Under Way for Female +63kg at 2014 Nanjing Youth Olympic Games— Medal winners in the female +63kg weight division of the taekwondo competition at the 2014 Youth Olympic Games pose during the awarding ceremony at the Nanjing International Expo Center in Nanjing, China on Aug. 21, 2014. The United States' Kendall Yount beat her final-match opponent, Uzbekistan's Umida Abdullaeva, 4-2 for the gold medal. Host China's Chen Li and Ukraine's Yulia Miuts had to settle for the bronze medal in the same female weight division. NANJING, China (Aug. 21, 2014) — The United States and France clinched one gold medal each on the fifth and final day of the taekwondo competition at the 2014 Youth Olympic Games in Nanjing, China on Aug. 21, 2014. In the women's +63kg weight division, the United States' Kendall Yount beat her final-match opponent, Uzbekistan's Umida Abdullaeva, 4-2 for the gold medal. Yount made it to the final match as she defeated Ukraine's Yulia Miuts, the bronze medalist at the WTF Taekwondo Qualification Tournament for the 2014 Nanjing Youth Olympic Games and the gold medal winner at the 2014 World Junior Championships last March, 9-4 in a semifinal match. "I am so amazed and so excited and I can't tell how proud I am," said Yount shortly after the awarding ceremony. 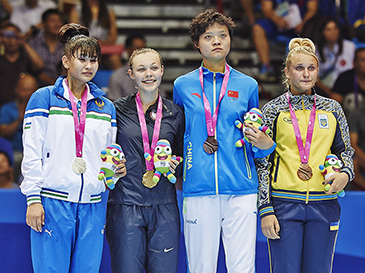 Host China's Chen Li and Ukraine's Miuts had to settle for the bronze medal in the same female weight division. Meliton Sanchez Rivas, an IOC member from Panama, presented medals to the winners of the female weight category, together with Fred Buitenhuis, president of the Taekwondo Bond Nederland. In the men's +73kg weight division, France's Yoann Miangue brushed aside a stiff challenge from his final-match opponent, Ukraine's Denys Voronovskyy, to win the match 6-4 for the gold medal. Miangue, the bronze medalist both at the WTF Taekwondo Qualification Tournament for the 2014 Nanjing Youth Olympic Games and the 2014 World Junior Championships last March, advanced to the final match as he beat China's Jintao Liu in the fourth golden-point round of a semifinal match. China's Liu and Turkey's Talha Bayram earned their respective countries the bronze medal in the same male weight category. Meliton Sanchez Rivas, an IOC member from Panama, presented medals to the winners of the female weight category, together with Roger Piarulli, president of the French Taekwondo Federation and a WTF Council member. The five-day taekwondo event took place at the Hall D of the Nanjing International Expo Center, attracting a total of 100 young athletes from 59 countries. Twenty international referees, 10 males and 10 females, officiated at the taekwondo competitions. The taekwondo competitions featured five male and five female weight divisions, and matches of two weight categories were conducted every day. A total of 22 countries took home at least one medal at the taekwondo competition of the 2014 Nanjing Youth Olympic Games.